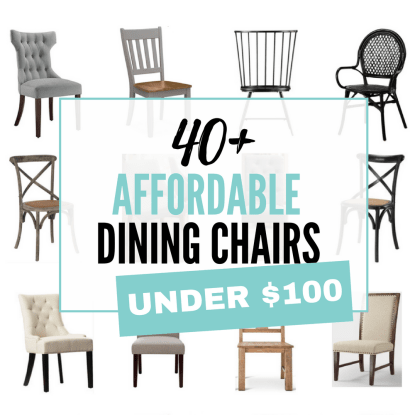 If you haven’t heard of the $100 Room Challenge, it’s a month-long design challenge in which a group of bloggers commits to redesigning a room in their home with just $100. 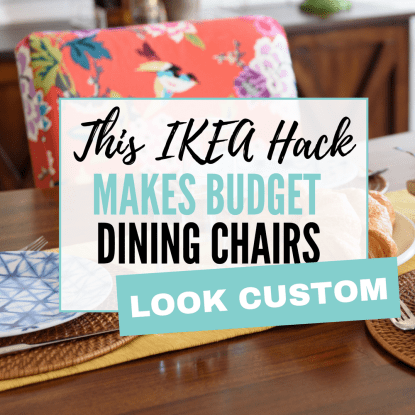 The whole point of the challenge is to show what’s possible on a real-life budget. 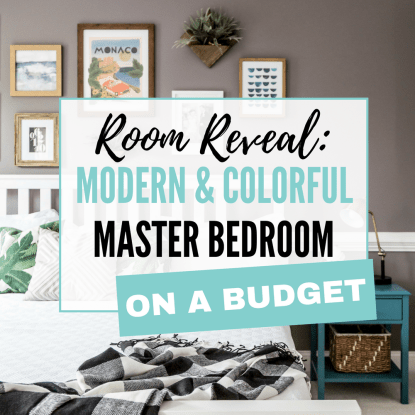 In my first post, I shared my design plan for the kids’ shared bathroom refresh, and in my second post, I talked about our budget breakdown and how I keep costs down when decorating our home. Read the week one post about the design plan here, and check out week two’s post here. Since my last post, we’ve made some solid progress on the kids’ bathroom. 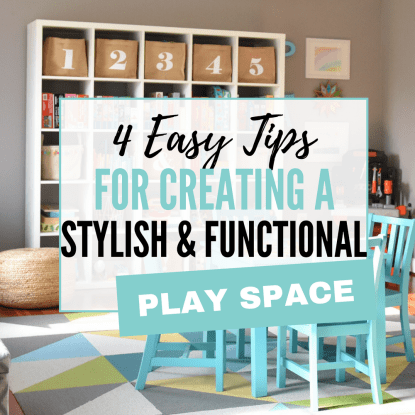 I ordered all the items needed for the space — including a new bath mat, two wall shelves and hooks for the bath towels, as well as some super cute wall art (the digital download cost less than $7!). Most importantly, though, we (and by “we” I really mean my husband) painted the bathroom white. And wow, what a difference it makes. (I’ll share photos soon, promise!) Next up is installing the wall decals, which I’ll tackle over the long weekend. 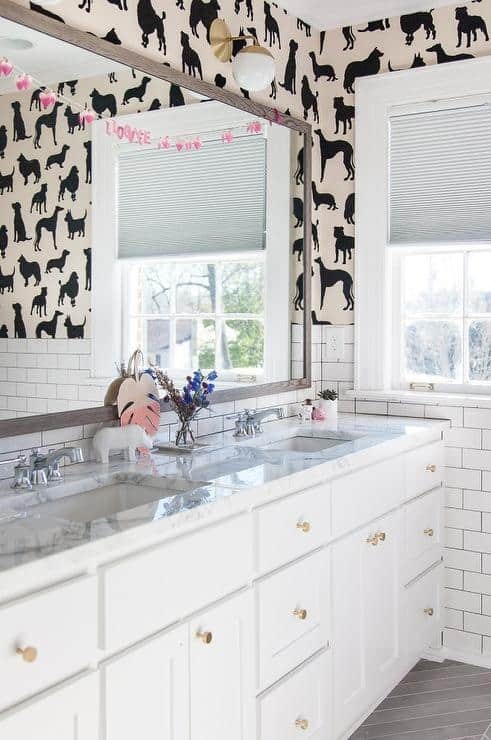 But in the meantime, since all I really did was paint and shop (which is kinda boring and not all that post-worthy), I figured I’d share with you some great shared kids’ bathroom decor ideas that might inspire YOU to take on your own budget-friendly room makeover. 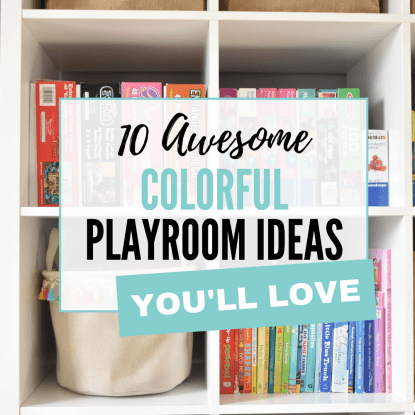 Take a peek at these gorgeous, colorful shared kids’ bathroom ideas — and tell me which one(s) you love the most in the comments! 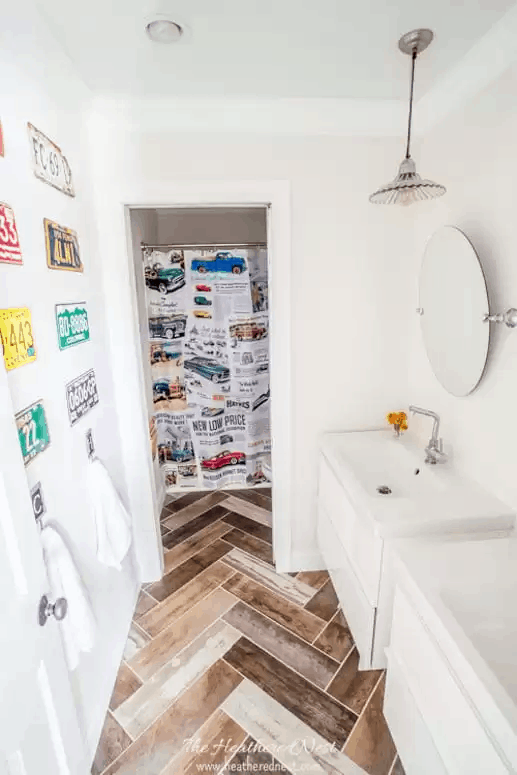 A fully renovated bathroom for just $1,800?! Color me impressed. 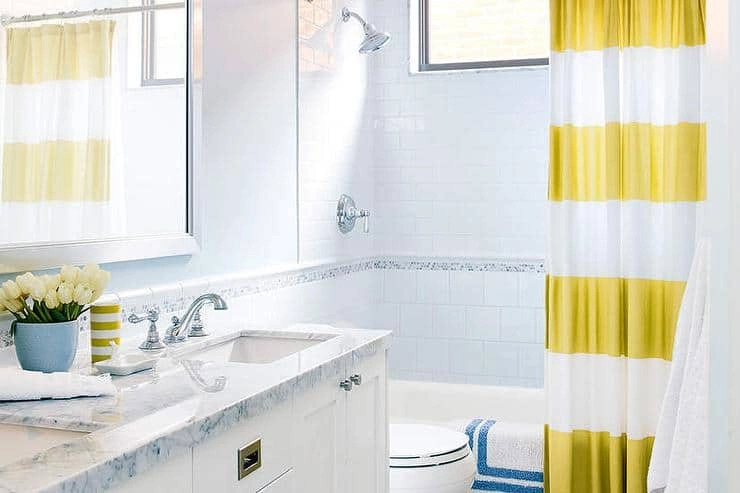 And you’ve got to see the “before” — you won’t believe it’s the same bathroom. 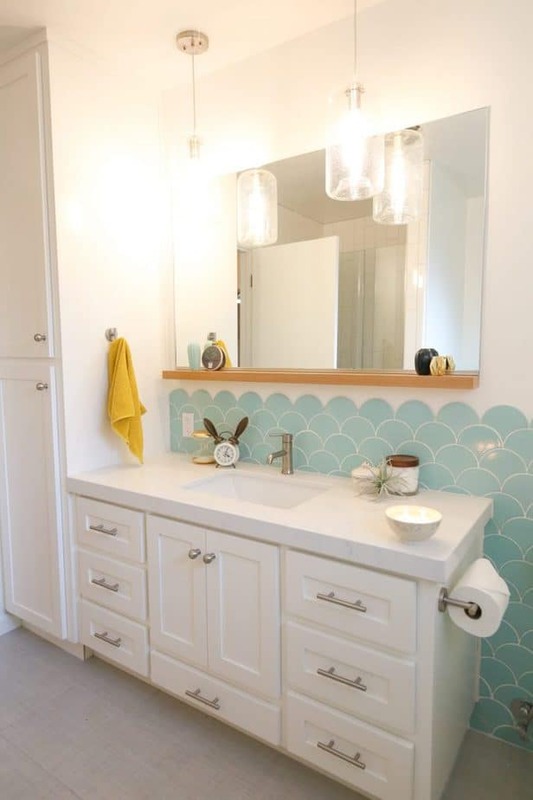 If your kids’ bath is also the guest bath, using a bright mix of patterns in your decor is a great way to pack a colorful and fun punch that’s appropriate for all ages. And because colorful stripes = WINNING. 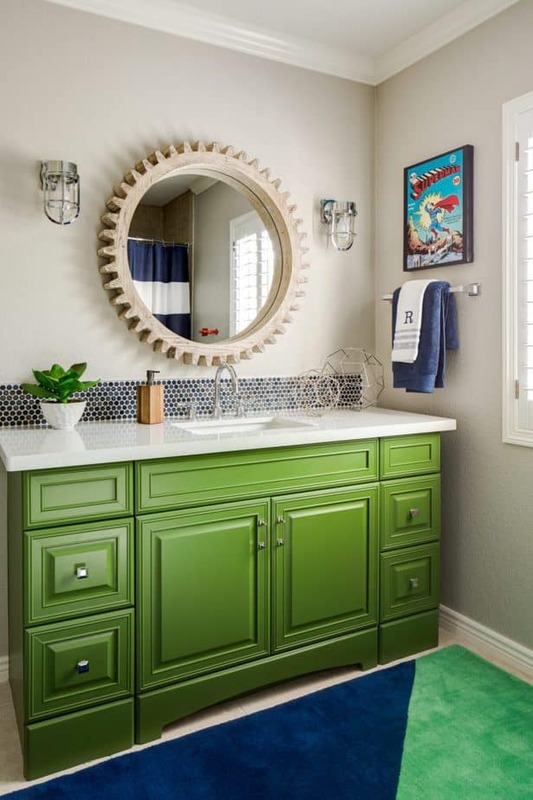 Understated superhero details and a colorful vanity? Boy bathroom perfection, right here. A neutral color palette and LOTS of drawers make this bathroom a winner in my book. The best part of starting with neutrals is that you can layer on loads of color if you want, or keep with a fresh, minimalist look. 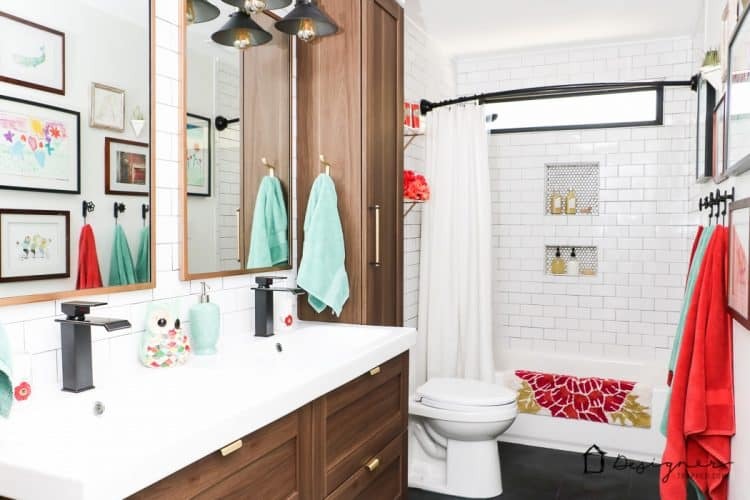 This DIY bathroom reno is just TOO good, and the pops of happy color are just perfect for the two little girls who share this space. Just like the space above, Tasha started with a neutral backdrop and layered in bold hues. 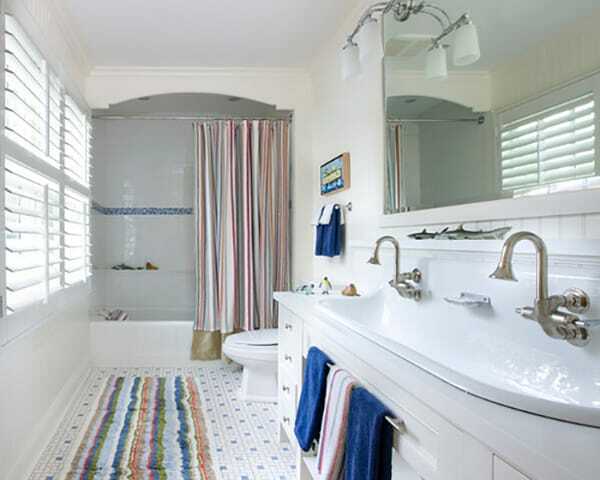 This basic bathroom got a splash of sunny fun with the yellow striped shower curtain and yellow accessories, which I love. I mean, how could you not smile when walking into this space?! 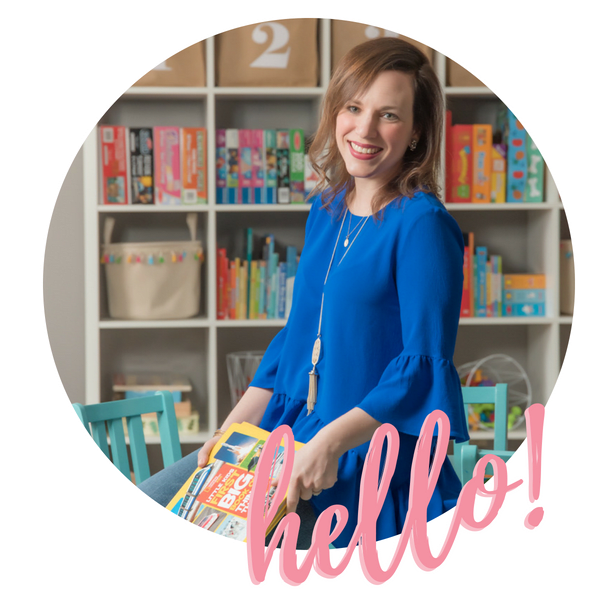 I’m not a fan of themed kids’ rooms, but I am a fan of fun wallpaper that makes a space a little more playful. Kinda like this adorable wallpaper here. 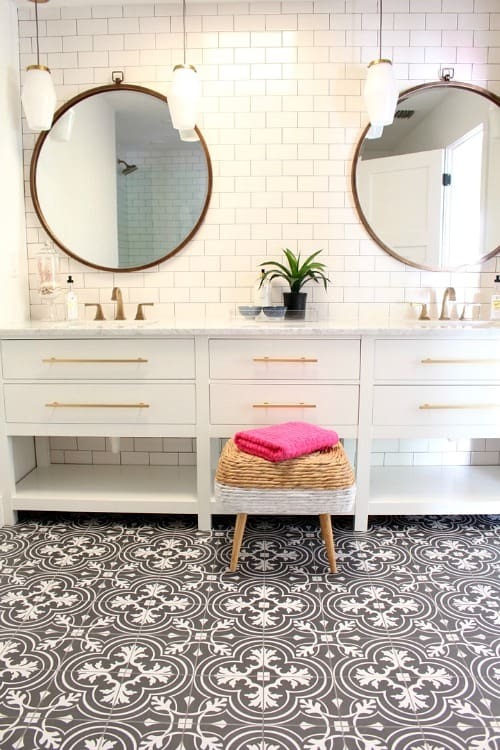 Sometimes all you need to give your bathroom new life is some super cool statement tile. Kinda like this (see below). Sometimes it’s all about the details. 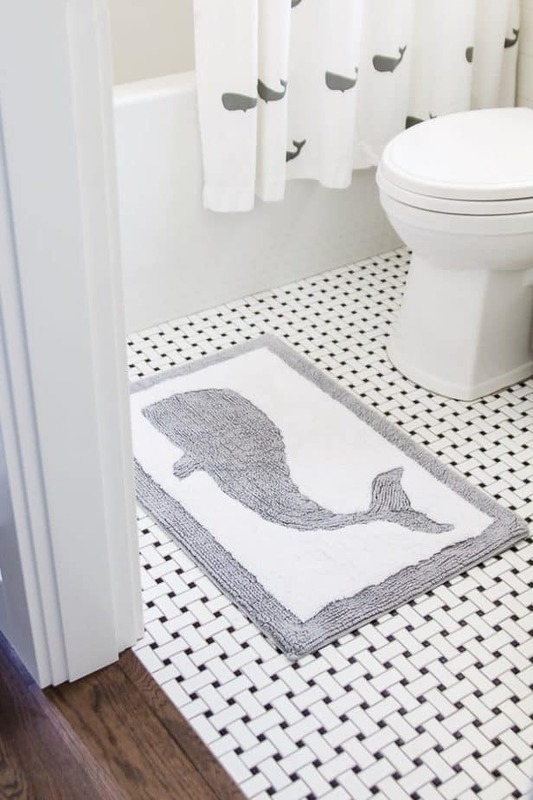 And when you find the most adorable whale-print shower curtain and a coordinating rug, you go for it. What do you guys think? Are there any ideas above that are inspiring you? By the way, did you love this post? Pin it! Heather’s bathroom was one of my favorites during that One Room Challenge! 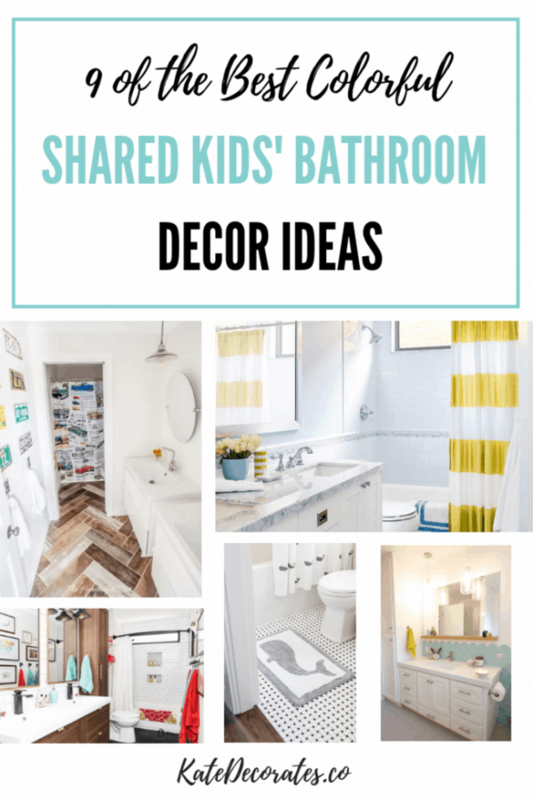 Such great ideas for those kids’ bathrooms, and I especially love the ones that you double as a guest bathroom. Layering color/pattern on neutrals is a GREAT idea!